Marco Huck successfully defended his WBO Cruiserweight championship for the twelfth time Stuttgart, Germany in front of a raucous crowd. The fight was a rematch of their November 2012 fight which ended in a very controversial unanimous decision that went Huck’s way despite Firat Arslan dominating the fight and beating Huck clearly. Arslan drove Huck to the ropes and attacked constantly in every round and Huck could not keep him away and his heavy hands could not hurt Arslan. Going into the rematch Huck was forced to make the adjustments in there as Arslan was going to and did storm forward the whole fight. For Arslan the questions surrounded his age and if he could do it again and if he did would the judges give him a decision. Early on it was clear that Arslan had the crowd on its side and it was also clear that this was going to be a good fight. Firat Arslan once again stormed out of his corner again sometimes in a sprint just to get to Huck, reminiscent of Ray Mancini in his heyday. Every round he was always on Huck from bell to bell with no breaks at all and continued to attack. The first three or four rounds were very difficult to score as both men had tight guards and kept their hands busy. In the first round Huck managed to get in some solid punches past the guard and even attacking the body. Arslan had a moment in the round with a solid connect with a hard right hook to the head of the champion. Round two was a great round as Arslan continued his charge toward the title. His left cross to the head and his left uppercut were featured punches along with his right hook to the head where he made some great work. Arslan’s best combination was a left uppercut finished off with a right hook to the head. He continued to pour it on. However, the champion was doubling up on his left hook; importantly he changed directions to get by the tight guard of the challenger. In the first fight he was befuddled by the high guard and aggressive style of Arslan. Huck used the left hook to the head and body to move Arslans hands around for openings and the body attack was going to wear down Arslan’s pressure. The third round was an important round because Huck showed diversity in his game rarely seen and his reputation has been built on his power but he used his feet. Arslan was coming full steam ahead all fight and Huck was still struggling to land consistently and keep the challenger away. In the third round he used his legs and tried walking Arslan into punches. Still the challenger kept coming and pressing in and keeping his target small. In the fourth round Huck landed a right to the solar plexus of Arslan that knocked him backwards briefly. Arslan quickly got back to business and he continued to go around the guard of Huck. To this point Arslan was in the fight and on the attack and had hurt Huck with his shots but Huck still did not appear to really hurt his opponent just yet. Round five was the turning point in the action and the most important round of the night. Huck moved even more in this round and did not let Arslan get set to throw his punches. Huck was able to outmaneuver the challenger and only left him brief spurts of aggression and walked his opponent into the right hand. The right hand was also now getting around the guard of Arslan and landing to the side of the head. This was the clearest round of the fight for scoring purposes and it was taken by the champion. The sixth round marked the end to an exciting fight. Early in the round Huck connects and wobbled the challenger. He immediately went on the assault with both hands attacking with wide right and left hooks to the head of his hurt opponent. Arslan fell to his hands and knees and barely appeared to get up. Referee Mark Nelson was slow to get a handle on the situation and the hurt Arslan had extra time to recover. The challenger in a last ditch effort went on an attack and landed several left hand blows before Huck dropped in a viscous right hand. A left hook came in and Arslan went down again and the fight was nearing the end. The brave challenger rose again but was soon cornered and stopped by the referee after numerous unanswered blows. This fight had a definitive end with no arguments. This was a great win for Huck who’s had a history of tight and even controversial decisions. However, Huck has been a great rematch fighter and a very exciting one and he left no questions here. He beat Ola Afolabi convincingly in their third meeting and took this rematch inside the distance. 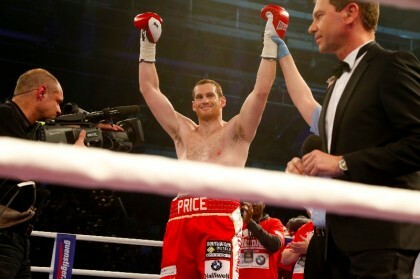 With this victory Huck has now put behind him most of his unfinished business at the moment. Denis Lebedev still deserves a rematch and that is a solid fight. On top of that a showdown with any of the other belt holders is a great match and hopefully boxing politics do not spoil a great opportunity. As for the performance Huck showed levels to his game and adjustments. He was a busier fighter, lots of times he has resembled an Arthur Abraham by laying back and only attacking in sudden bursts. Huck was very busy with his hands and he also mixed up the attack with his left hook to both the head and body. He also finished the fight in great fashion wearing down his wounded foe. Good fight, great crowd, what was not to like?